We are the Campas! : Alaina turns 21. VEGAS BABY! Alaina hit a major milestone this year with her August Birthday- the big 2-1!!! We set off for Vegas mid August and thanks to our Uncle Chuck we got to enjoy the luxury of a timeshare suite on the strip! The hotel was awesome! We felt like celebrities. 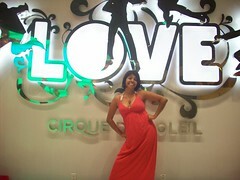 The highlight of the trip was the Cirque du Soleil Beatles "LOVE" show that we attended at the Mirage on saturday. The show was amazing! So beautiful! Alaina was completely satisfied cause she's the die-hard Beatle fan. 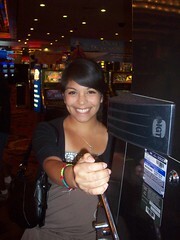 After the show, we took some more crazy pics, mom played the slots, and we walked around Vegas til the early morning. Weekend in Vegas complete!